Welcome back To Tennis Novak Djokovic. Tennis missed you. Like, really missed you. Don’t get me wrong: the Roger Federer and Rafael Nadal revival in your absence has been giddy fun—a throwback geezer party spectacular, as those two legends traded titles for a year and a half. But men’s tennis hasn’t been the same without you at your best, Nole. Your best was gone for more than a minute. It went into the wilderness for what seems like a couple of years. Even when you were around, you weren’t really around. Body trouble. Head trouble. You just weren’t yourself. I can’t believe I need to remind people of this, but it wasn’t so long ago that you were the undisputed best men’s tennis player on the planet. You were the boss, the capo, the patron. People used to write stories about how Roger Federer would never win another big one, and you were the main reason why. You were the roadblock. You went 82-6 in 2015, winning three of four majors. You have a lifetime winning record against both Federer and Nadal. People forget that. That is bananas. Then you went away. Sunday’s Wimbledon final was the first major final you reached in almost two years. How did it feel, Novak, to be in the wilderness? Playing hurt is awful. Missing time is worse. After losing in this tournament last year, you shut it down for the rest of your 2017 season. Everyone was an expert on your troubles. Strangers wanted to pick you apart. Diagnose you. Psychoanalyze you. Cut you open. Like this Wimbledon. You were seeded No. 12 here. A fair seed, given your recent play, but you’re a three-time champion. They didn’t put you on Centre Court until this past Wednesday. That had to bum you out a tiny bit. Now, at 31, you’re back. On Sunday you whomped Kevin Anderson in straight sets 6-2, 6-2, 7-6(3) to take your fourth Wimbledon men’s singles title. And yet this title is a bit of surprise, probably even to you. The final match was pretty painless, but getting there wasn’t. You endured a monster of a semi with Nadal, one that stretched over one night and one afternoon, thanks to Anderson’s marathon with John Isner. No disrespect to Anderson, who’s playing the best tennis of his life, but that Nadal semi was effectively the final, wasn’t it? It went five sets and more than five hours, and Nadal had more than a few chances. But as he elevated, you kept elevating, too. That’s what reminded people of the old days. At your best, I think you’re a vampire. I mean that in the best possible way: if you want to defeat prime-time Novak Djokovic, you’ve got to plunge a vampire stake to him. Until then, you keep coming, coming, coming, relentlessly. You use all available weapons. You play without fear. That ruthlessness was on display against Nadal. Nadal is also awfully hard to beat. Never takes a point off. You had to win it 10-8 in the fifth. This was a weird Wimbledon overall. The host nation was utterly distracted by the World Cup, where England reached the semifinals. President Trump arrived in London and rattled the town. 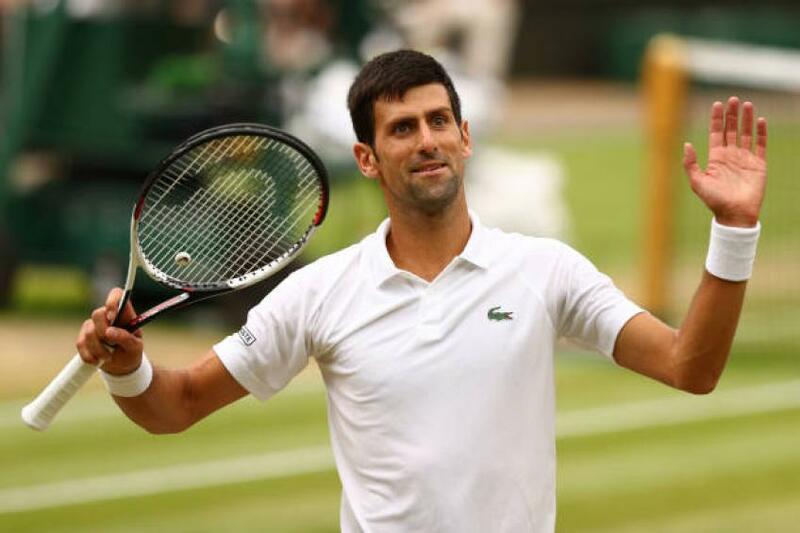 Meanwhile, there was a lot of talk at the men’s tournament about five-set matches and tiebreaks—and whether or not Wimbledon should eliminate the win-by-two games standard and use a fifth set tiebreak instead. Meh. I don’t know about you, Nole, but I think this is mostly a stylistic concern. I’d rather give my cat a bath every day for a month than watch another minute of Anderson-Isner. But I loved every minute of Djokovic-Nadal. I could have sat for another two hours. I say preserve the system. Keep tennis weird. And a salute to Angelique Kerber, who won the women’s singles on Saturday, her first Wimbledon title. And bravo Serena Williams, coming back after the birth of her first child and emergency surgery immediately afterward. A motivated Williams said after dropping the final that she is “just getting started.” That’s great news for tennis. You’re also great news, Novak. The Fedheads and Nadal-ites know a full-strength Djokovic means a harder road for their idols, but it’s better for the overall health of the sport. Andy Murray lurks, too. And one of these days, one of the kids is finally going to crack through. When you sealed it on Sunday, you took a nibble of the Centre Court grass like you did when you won your first one, and took joy that they’d let inside your 3-year-old son, Stefan, to see his Daddy lift the trophy. It’s all worth it now, yeah? All that time in the wilderness?